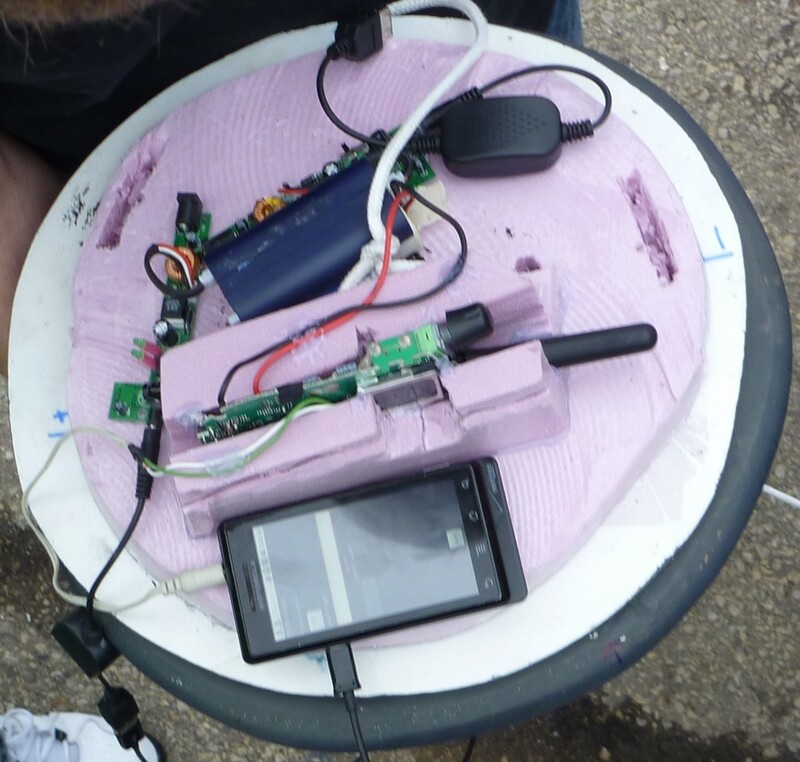 Riding on the success of Launch 5’s payload and electronics, Launch 6 was essentially a repeat of our setup. Preparation was much easier since all of the enclosure was ready, the electronics were ready, and we knew the quirks of the system. 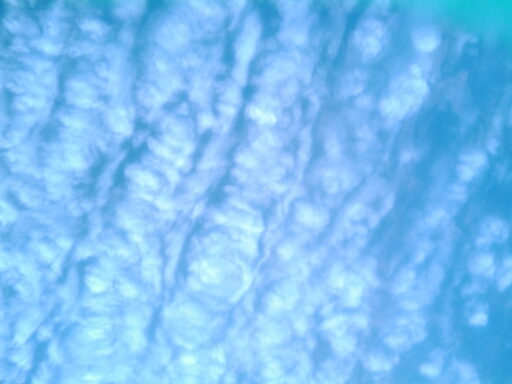 Even the weather and wind patterns were in our favor. The only downside was that only one of us had ever launched a balloon before. One other obstacle got in our way as well; the lid from our enclosure disappeared some time ago, and we needed a suitable replacement. a carved foam plug did the job well, and we used hot glue and duct tape to further seal it. On our previous launch the GoPro froze, so this time we added a hand warmer to the back, and put it in full 4k video mode so that it would heat itself up. One of our members, Bob Baddeley, launched his product this weekend; a wireless tip-up sensor for ice fishing called BlueTipz. 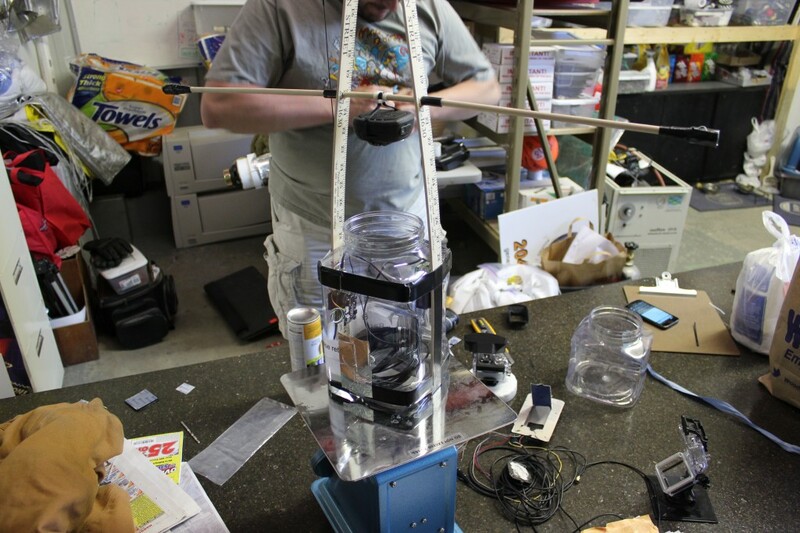 To celebrate the launch, and do some extreme altitude product testing, he added his product to the payload. Gluing the battery to the board. 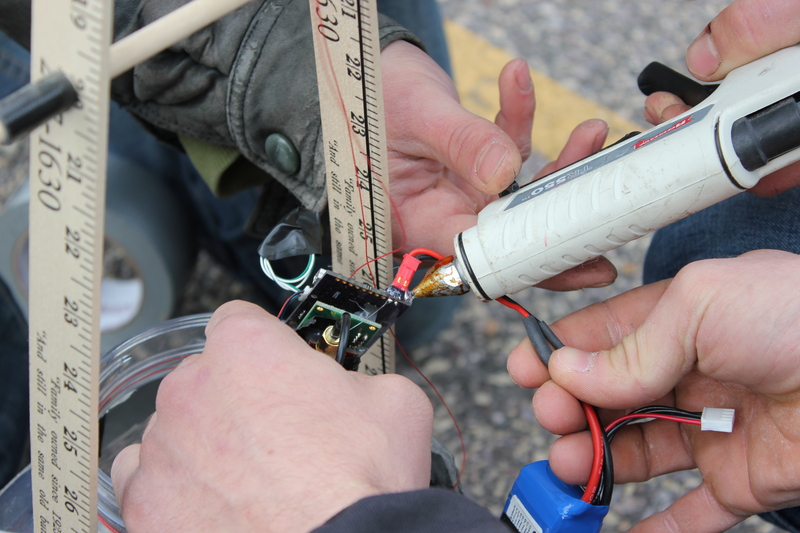 We wanted to ensure that the battery would not disconnect, as loss of battery pretty much guarantees a lost payload. Verifying the payload is transmitting packets that are readable. 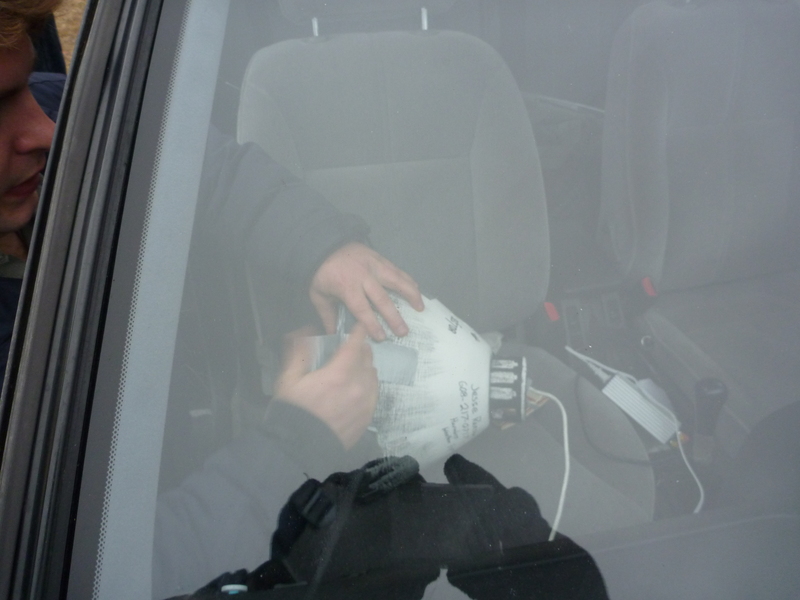 We had a laptop and antenna connected in the car, listening to validate the payload was ready for release. The payload just before launch. The launch was successful and the balloon went off into the air quickly, thankfully rising out of the parking lot before getting close to the very tall trees. 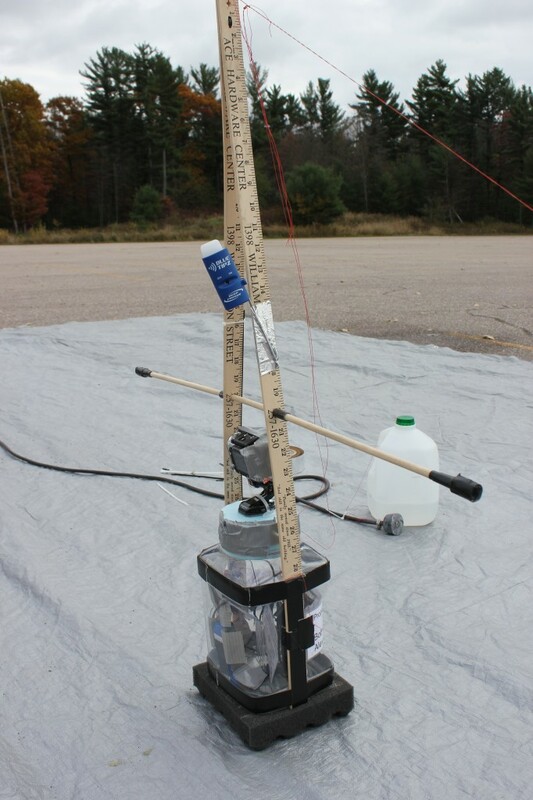 Once again, the CUSF Landing Predictor was impressively accurate with our trajectory, which makes us more and more comfortable about using it to determine where to launch. 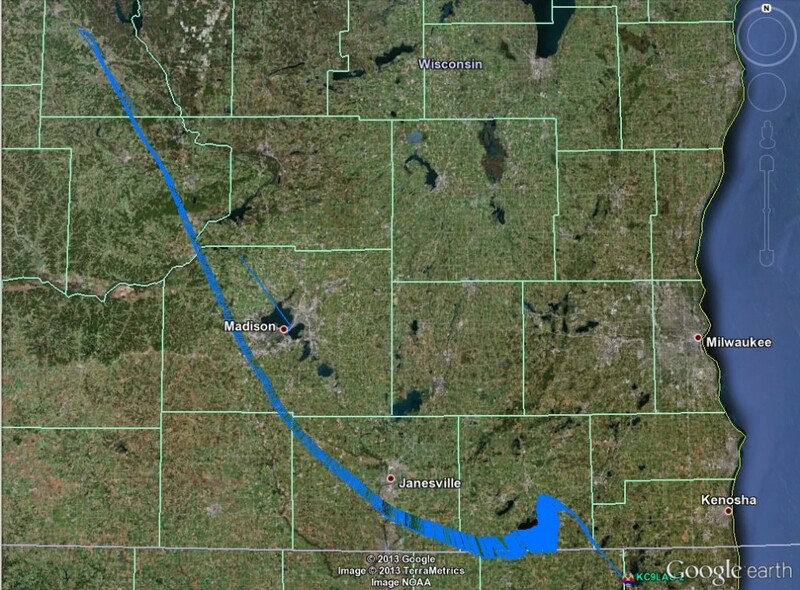 Launch 6’s flight path. Peak was around 59000 feet. Here is video of the peak. Unfortunately, there wasn’t enough memory in our SD card and we didn’t get the entire mission, but we got some good footage. We recorded in 4k video, so every frame is amazingly high definition. 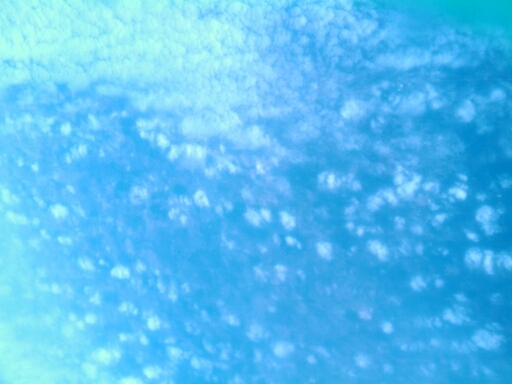 Now if only we could see through clouds. 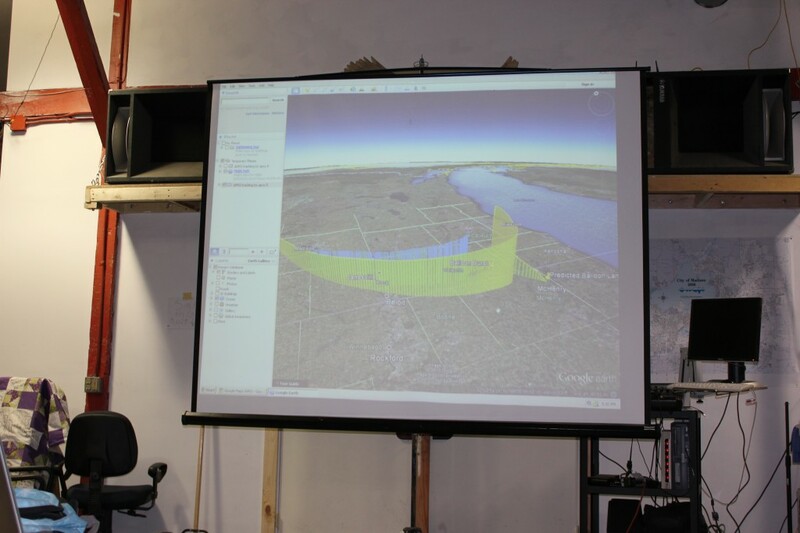 After dropping off our hydrogen tank back at Sector67 and re-running our simulations to get an idea of where it would land, we took off for Burlington, the projected destination. 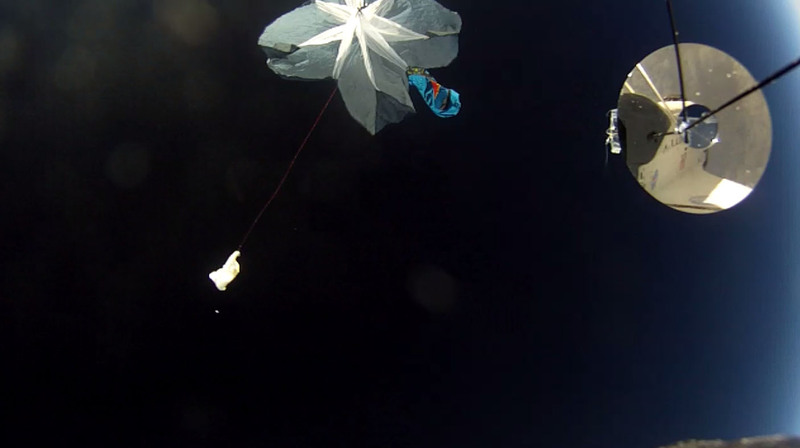 By this time the payload was already descending. Once we got close, our antenna was picking up the signal, and we were able to get the exact coordinates of the enclosure. 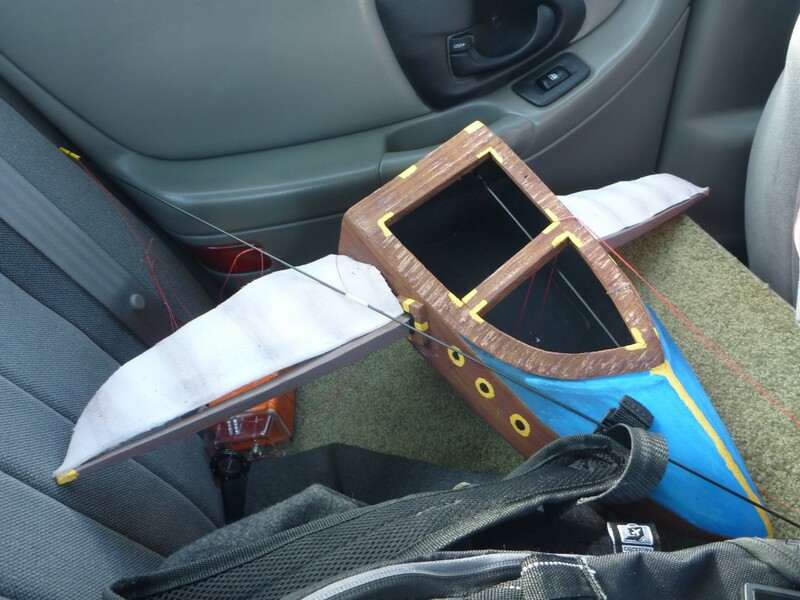 It had landed in a corn field, so finding it would have been impossible without knowing exactly where it was. 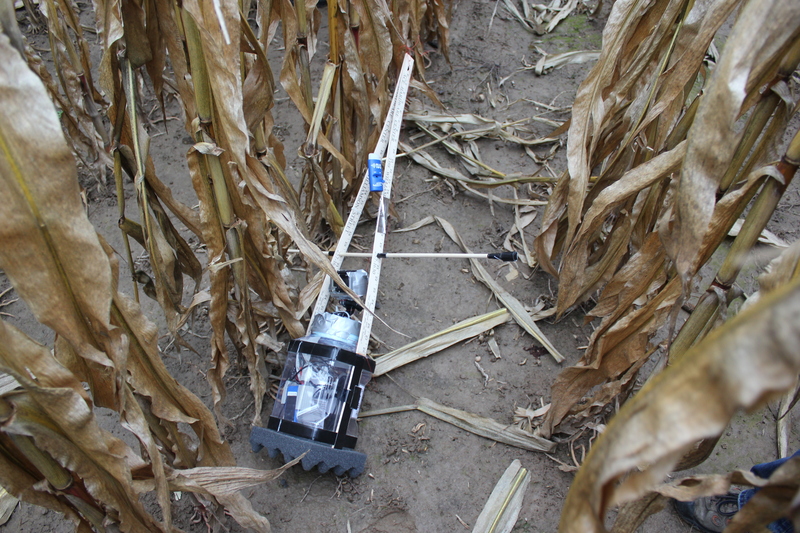 Using the coordinates to find the exact location in the field. 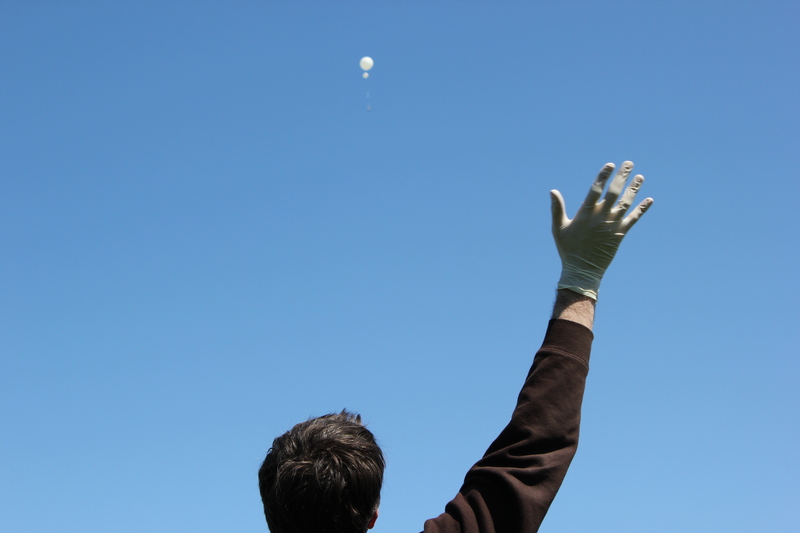 On May 12, as part of a going-away celebration for our departing Apollo67 team member, we launched yet another balloon. 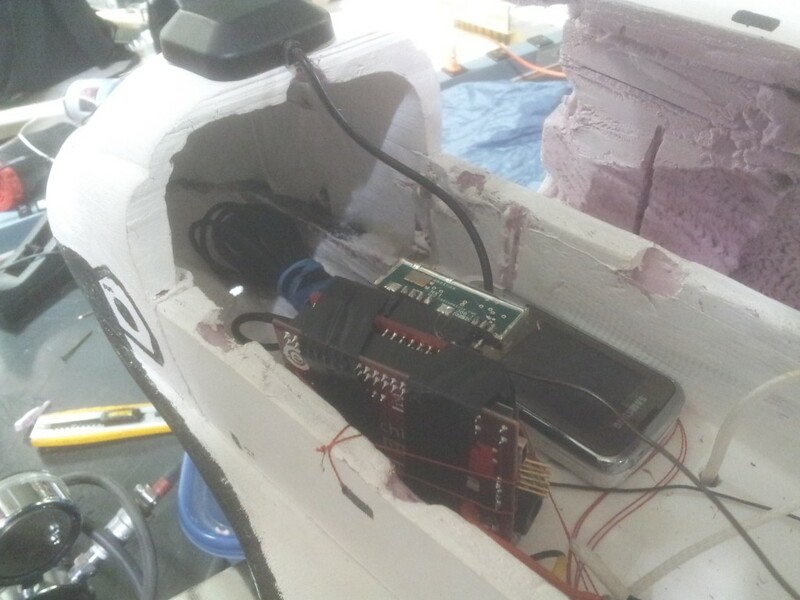 He is now on the other side of the world in Australia, and we are currently drawing up plans to deliver a payload to him via high altitude balloon. We think crossing the equator and a couple oceans may be challenging. 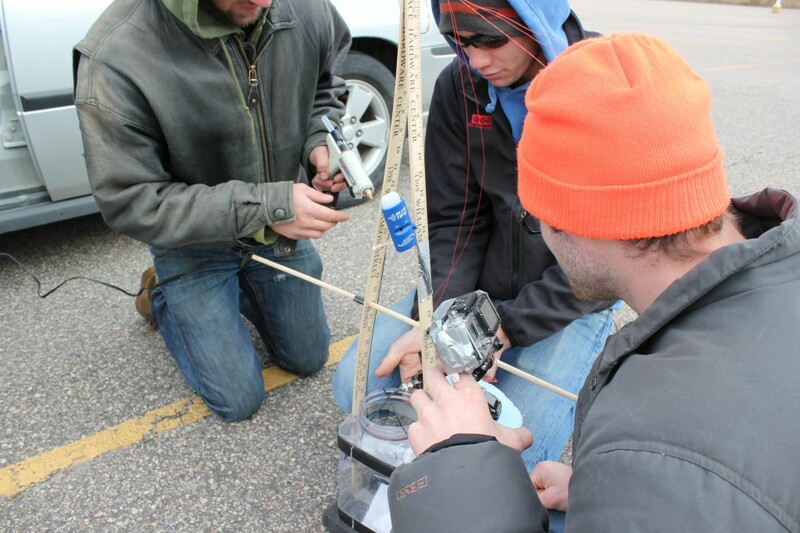 During this launch, we nailed our telemetry. 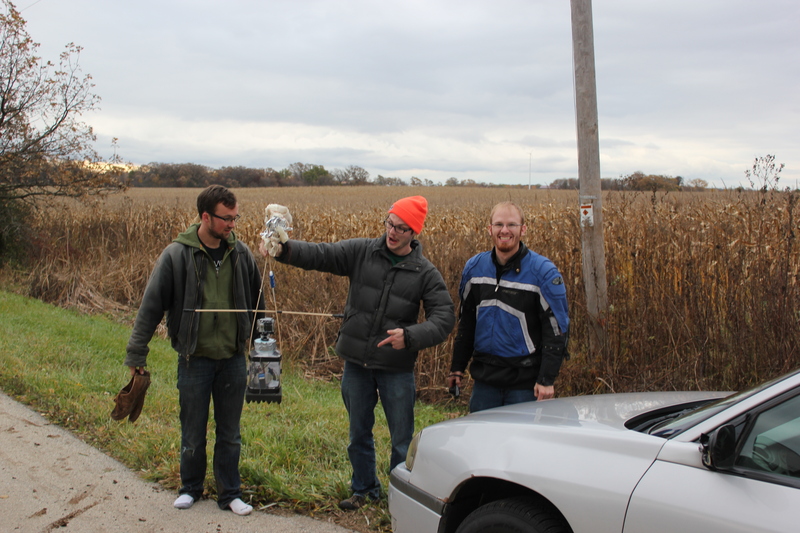 We had enough radio equipment to guarantee that we were going to track this thing. 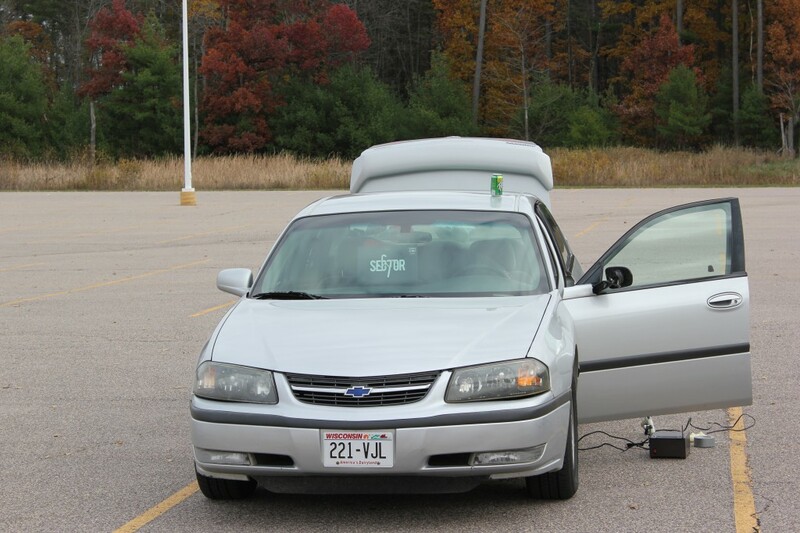 We had an APRS beacon blasting FAR more frequently than it should have been, and a good GPS chip, and decent antennas. We also had an IR blaster attached to a 9V battery so that after landing it would be easily visible with night vision goggles at night (most of our recoveries run into the evening/night). On the ground, though, is where we had the real powerful stuff. 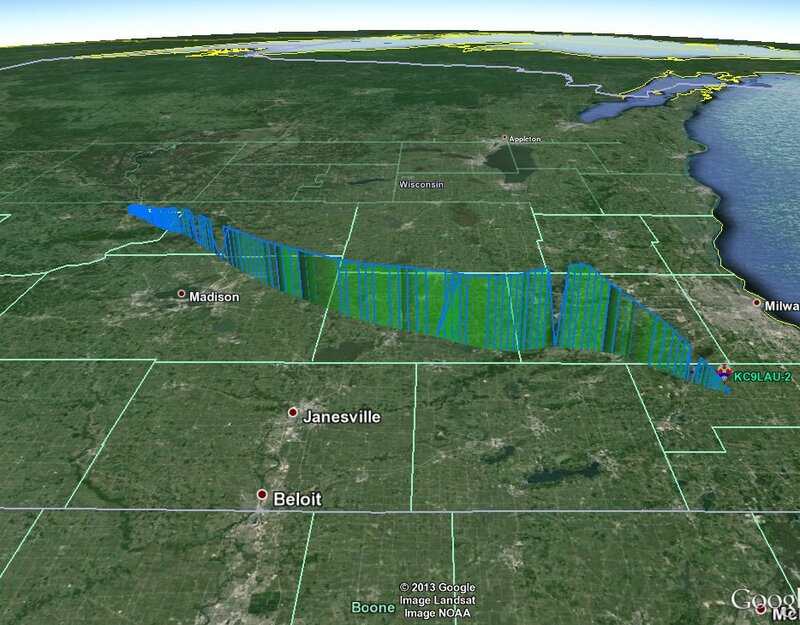 We had a radio with an antenna on a mast so that after the landing we would still be able to track it (once the radio goes below a certain altitude, the likelihood of an APRS receiver capturing signals is low, so it becomes difficult to track the final GPS coordinate of the balloon). 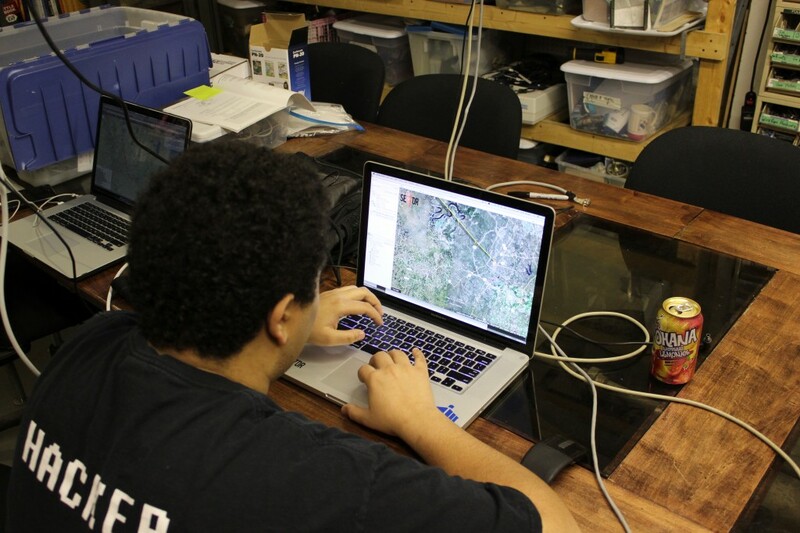 A laptop parsed the radio signals and was able to lead us directly to the final location of the payload. This turned out to be a good thing. It turned out that our flight path took us almost directly over Madison. If it had gone straight over we might not have captured photos of it, but this path gave us some great results. There were bets on whether it would land in Wisconsin or Illinois. It just barely made it into Illinois. Original prediction (yellow), modified prediction (green), and actual (blue). Modified prediction was taken after calculating the actual ascent rate an hour into the trip. This gave us a much more accurate prediction. A horizontal view of the original predicted (yellow), the modified prediction (green), and the actual (blue). Issac hacking on the computer to make sure everything is working. This package didn’t use a custom foam enclosure; this time we went for waterproof and rugged, and it’s a good thing we did. This was a simple and effective enclosure. 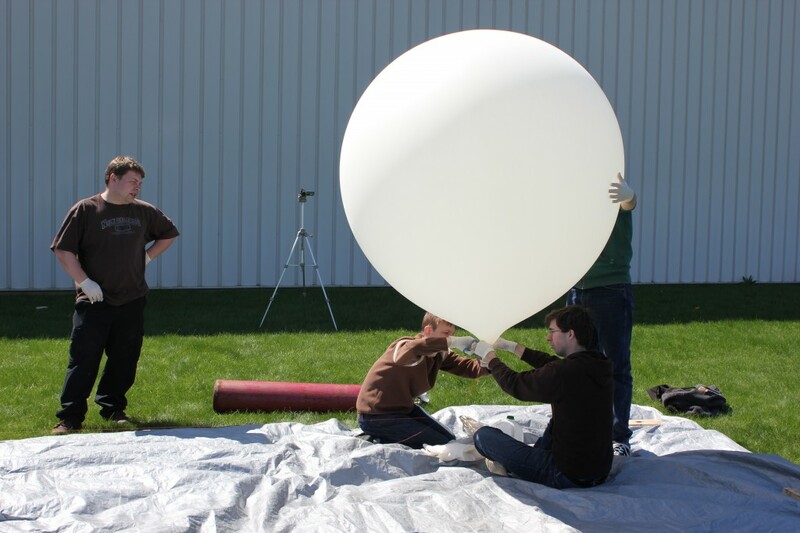 The full payload being measured to estimate how much to fill the balloon. Chris testing out equipment for recovery before we leave. 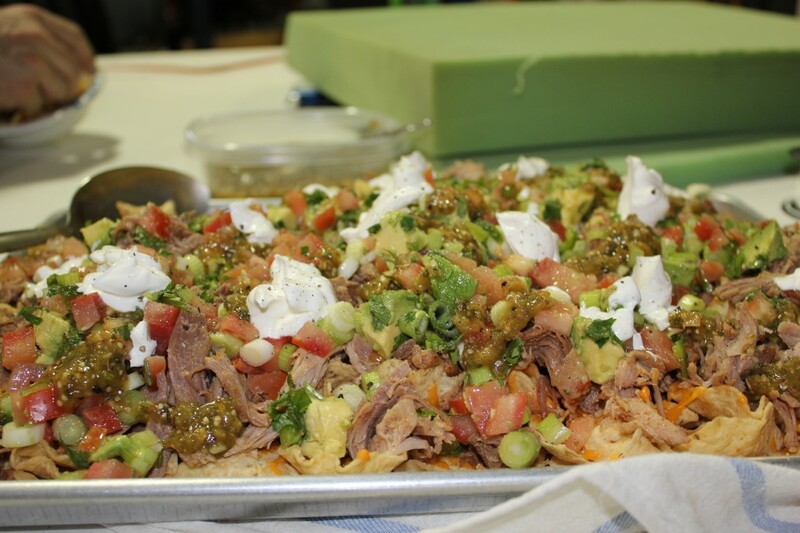 Nachos break! Before leaving, we took a break for nachos, leftovers from the Chris and Heather wedding reception the night before. We found a perfect spot in the wind shadow of a warehouse on a very grassy field. Alex holding the balloon steady. Watching the balloon travel back at Ops (Sector67). We knew it would be traveling by Madison, so we hurried back to Sector67 to regroup and change cars and people, then start chasing the balloon. After the balloon stopped moving, we knew approximately where it was. We went there and set up the equipment to get a more exact reading. Here is Issac pretending to be Jack Bauer. There it is! Using the radio to decipher its final location. 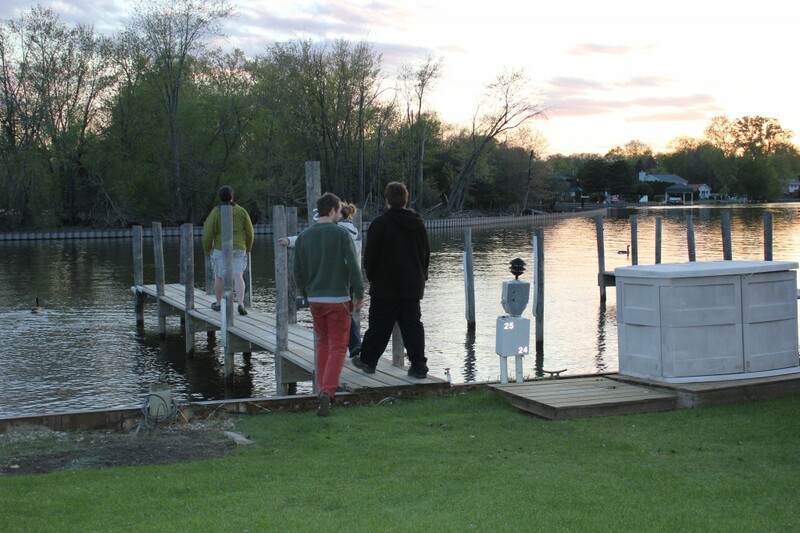 It looks like it might be in the lake. 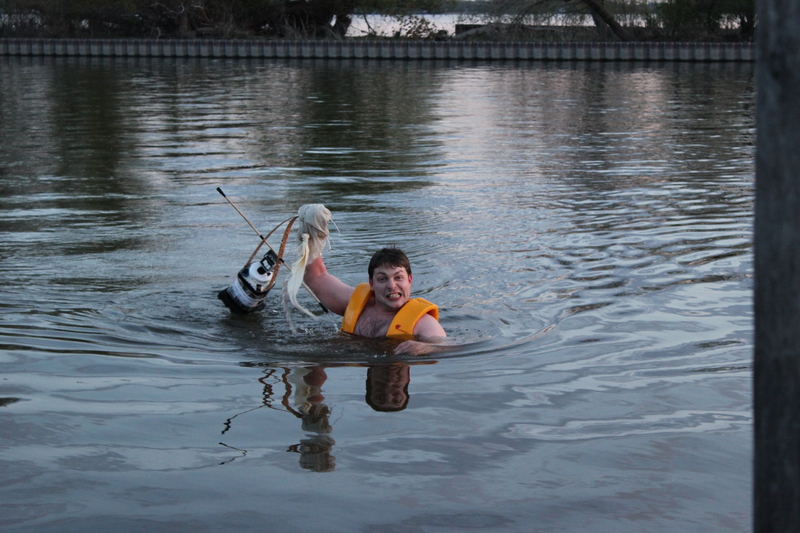 Jesse bravely rescues the soggy payload. Fortunately the insides were perfectly dry. Looking at the video after recovery. It was a nice launch, just not a nice recovery. Here is a video that shows the launch and more details. Apollo67 had its third launch this weekend. Our goal was to test different hardware this time. 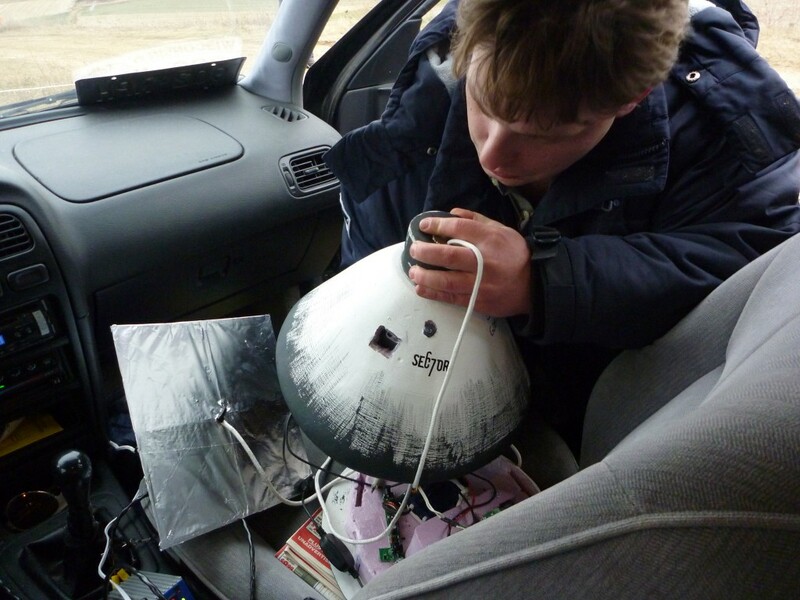 Previously, we had problems with the cell phone because it lost signal quickly but then didn’t acquire signal at all or only after a long time after landing; it’s not a good solution for tracking a balloon in progress or reliable enough to find it after it lands. Our original plans called for only the cell phone because it’s technology that’s easily acquired, and indeed we continue to use it as our backup plan. The experiment for this weekend used a Chipkit (an Arduino clone built on the Microchip line of microcontrollers) and an APRS module, which is short for Automatic Packet Reporting System. APRS is set up for exactly this sort of purpose. There are thousands of people around the world who have big antennas attached to computers that listen to a specific frequency for short bursts of data packets, and they report those bursts to the internet. 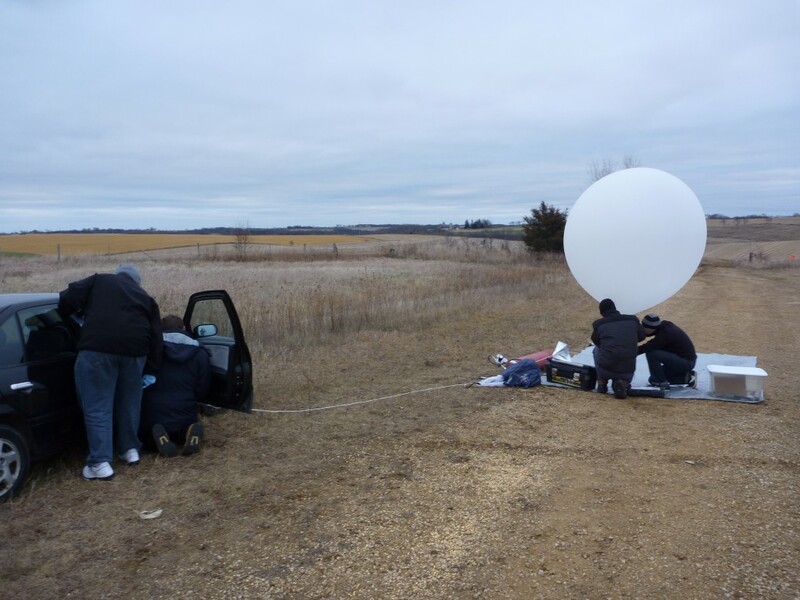 We were able to launch our balloon using our APRS module, and knowing the call sign (kc9lau-11), we were able to use aprs.fi to help us track it with updates every 60 seconds. 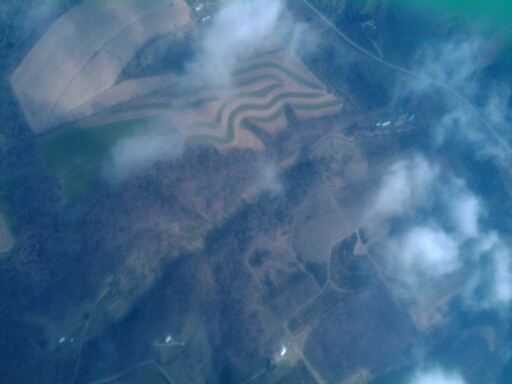 Below are some highlight images, and a video of the entire flight, sped up and slowed down as appropriate. 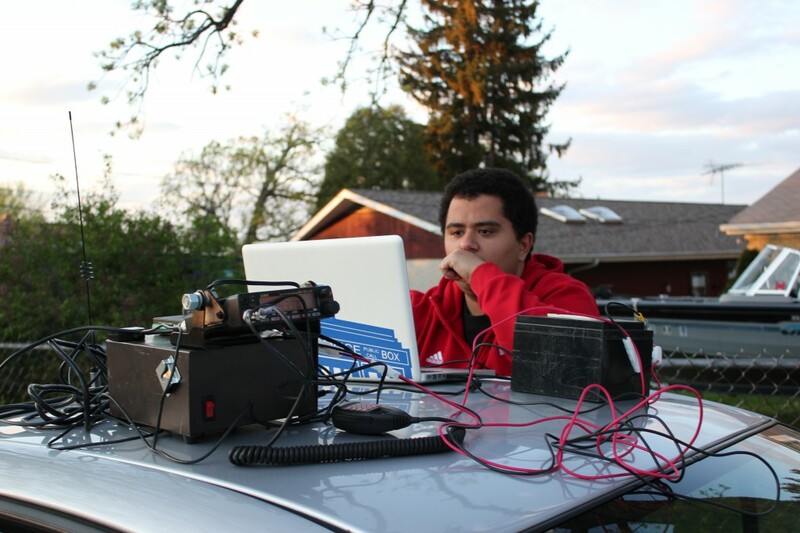 Issac spent a lot of time developing the APRS module and getting it to communicate with the Chipkit, but eventually got it working. The enclosure was one Jesse had built over a year ago and had been itching to put into near space. 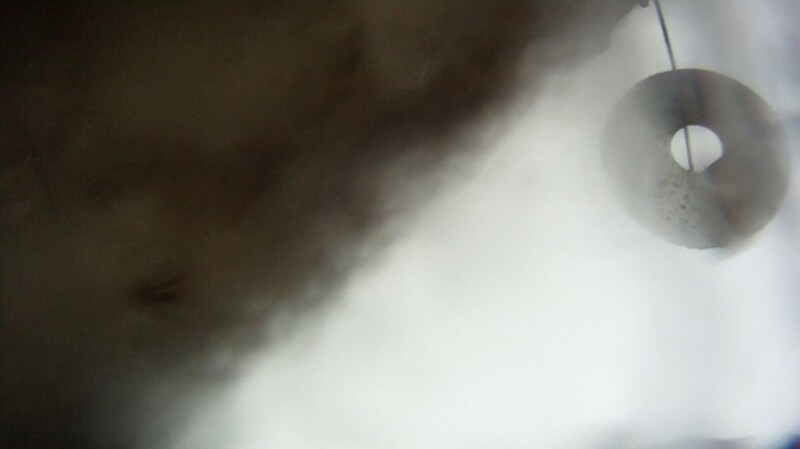 Todd contributed the GoPro. 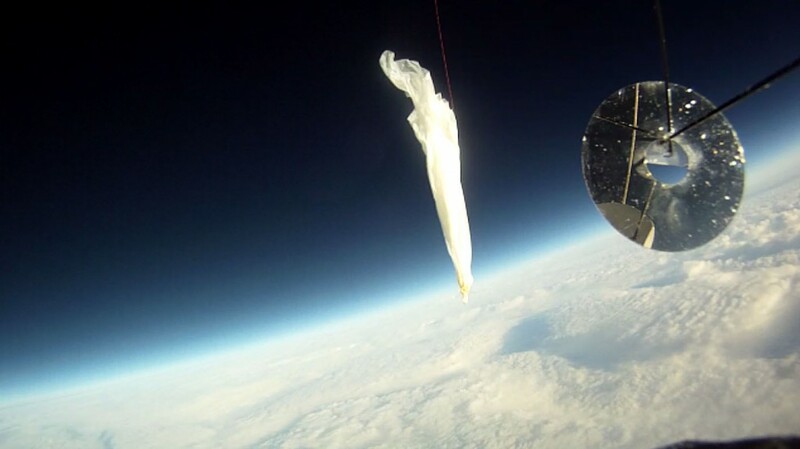 There was also a cell phone for recovery, a parachute for controlled descent, a mylar celebration balloon for radar reflection, and a GPS receiver chip. The local flower shop was gracious enough to open early for us and supply us with a partially filled balloon boot that celebrated a boot scootin’ birthday, so we had an appropriate level of celebration on our payload. The package weighed in at 1012 grams, not including the 300g balloon. After the firmware and hardware was complete, a quick drive around the Capitol verified that the APRS was working, and we were set for the next morning. Saturday morning we arrived bright and early and checked weather, flight forecasts, battery life and other pre-flight items. We packed the car according to our checklist. 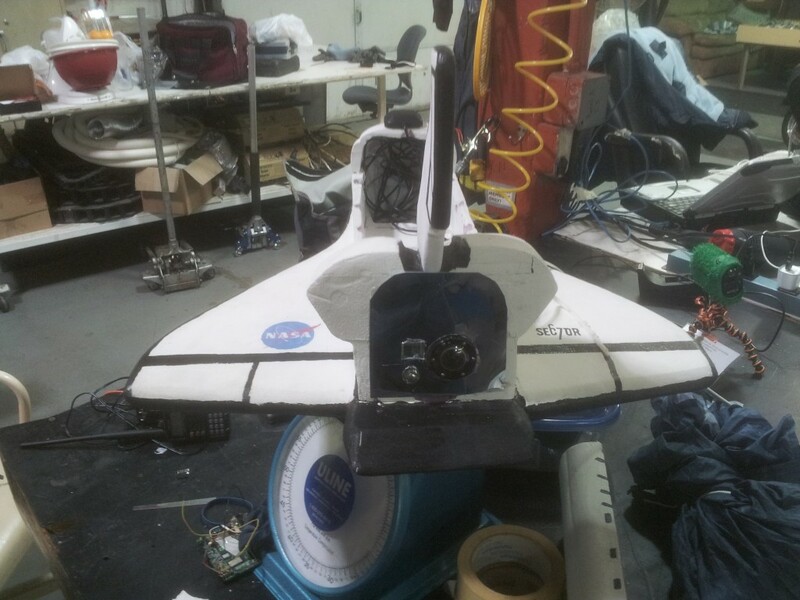 We made a last minute addition of a mirror on a boom so that the GoPro facing out the back would be able to see the shuttle and the view in front of the shuttle. By noon we were on the road to Platteville, and the clouds and rain stayed the entire time. We managed to find a gazebo to stage the preparation, though it somehow continued leaking and dripping even after the rain stopped. 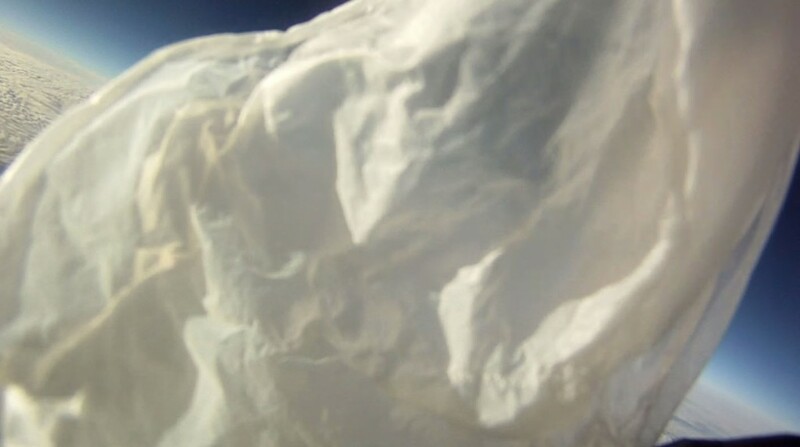 By now we’ve gotten comfortable with the procedure and the four of us were able to set up, prepare the payload, fill the balloon, and launch in reasonable time. We used a bottle filled with water to the same the lift weight we needed, and when the balloon could lift it we knew we had inflated it enough. It was about 8′ in diameter. We verified that the APRS beacon was working before releasing. 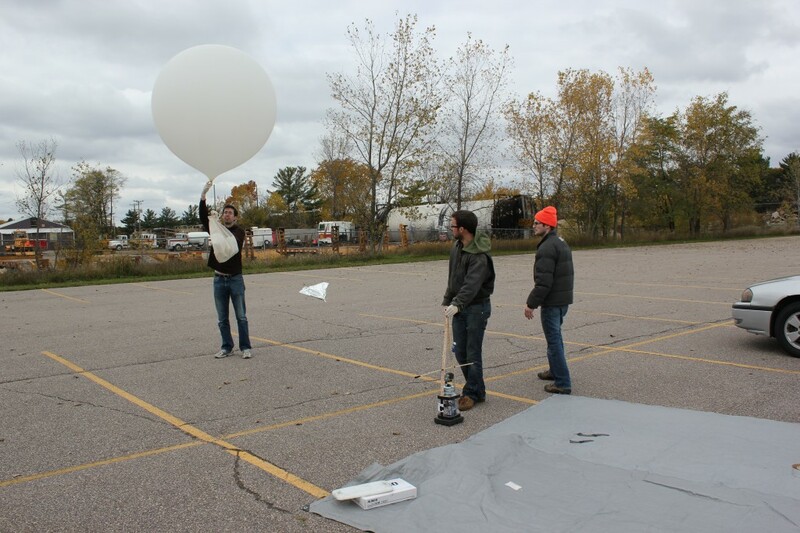 Then slowly let the balloon up so that we were just holding the payload. 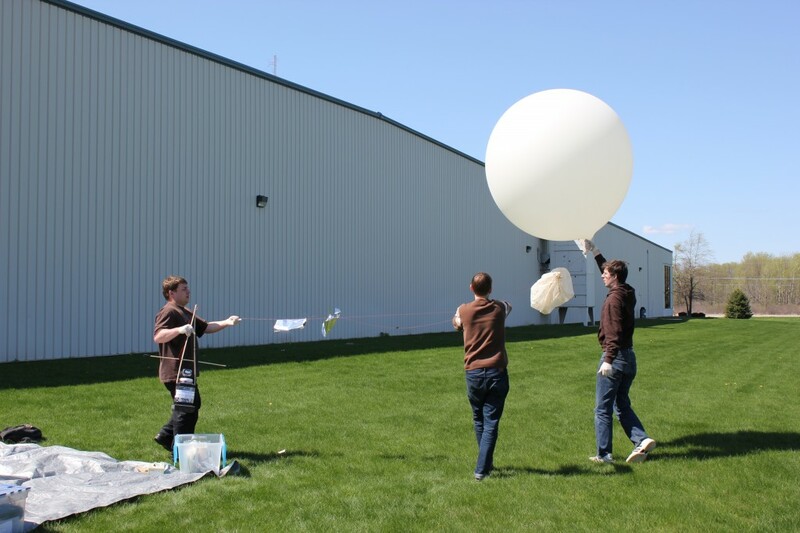 This ensured that there was no slack and that the balloon wouldn’t just rip away from the payload when we released. 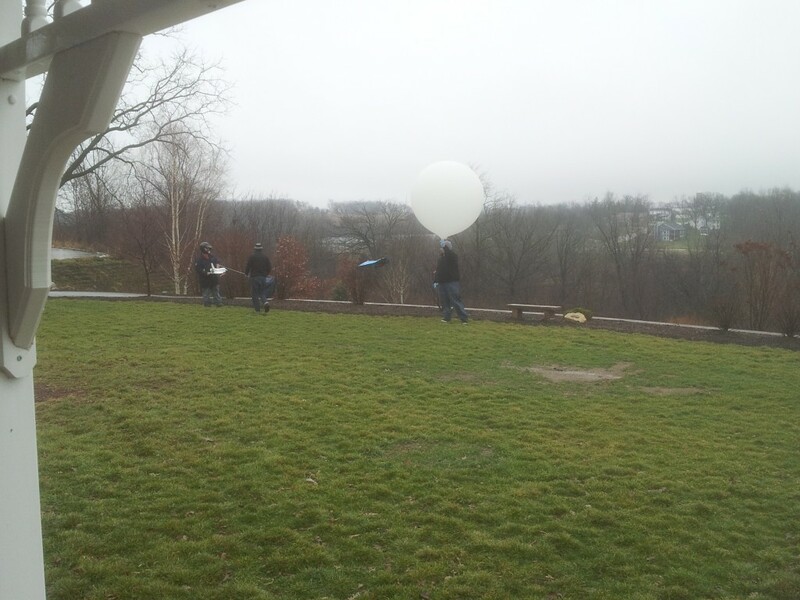 The balloon quickly ascended into the clouds and we waited for the APRS signal to show up on the map. After a quick lunch, we started driving in the direction it was heading. Jesse is wearing the helmet because it’s cold and raining, NOT because he’s carrying a tank of hydrogen gas. About to release the balloon. As we drove, we at first thought it would end up West of Madison. 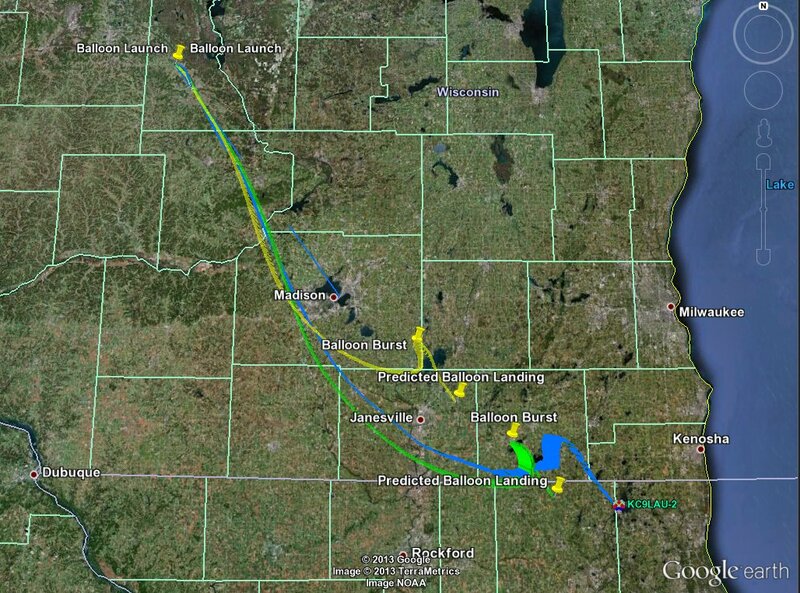 Then it hit the jet stream and shot across the map far faster than we could drive. For some reason, the altitude wasn’t reporting correctly, so we had no idea when it would pop or if it was descending. We realized just how many lakes were directly in the flight path, and held our breaths each time it went over one, anxious for it to report a new location on the other side of the lake. When we were on the other side of Madison we decided to stop at Sector67 and unload our hydrogen tank and wait for it to land. At last, at 3:54, 2 1/2 hours after our 1:30 launch (and a full 40 minutes longer than our estimated flight time), we stopped getting updates. The cell phone, however, only rang once and then was no longer available. Because we didn’t have any more updates from the APRS, we didn’t know if it had stopped reporting or had gone below a certain point where it wasn’t being picked up anymore. Further, it was getting dark. When we arrived at the site of the last known location, it was already dark. 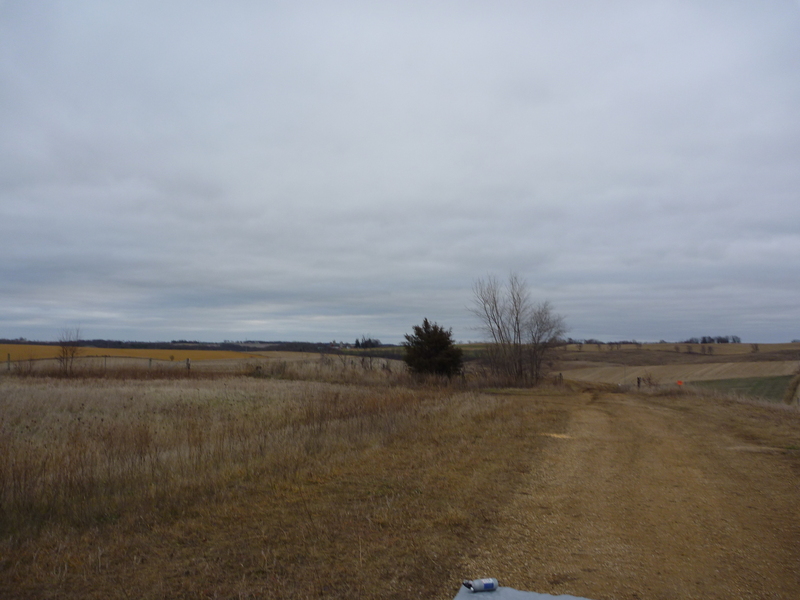 We started looking and tromping through the field, but we didn’t know where exactly it was, and we didn’t have great visibility, and it started raining and snowing. Eventually, we had to give up. Sunday morning the recovery team returned to the site to continue looking. The funny thing about day time is that you can see a lot more; the package was in the field we were searching, but in a far corner that we had just missed. It was in surprisingly good shape, though the nose had taken a beating and separated. 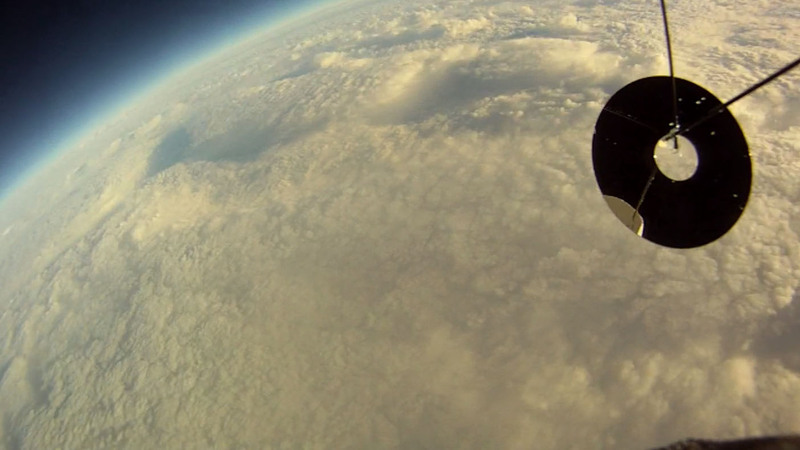 Data from the GoPro was fantastic, and we were able to compile the following video. We are completely comfortable with the hydrogen gas now. It is not intimidating to us and has not been a problem in any of our launches. We are getting better at launching. 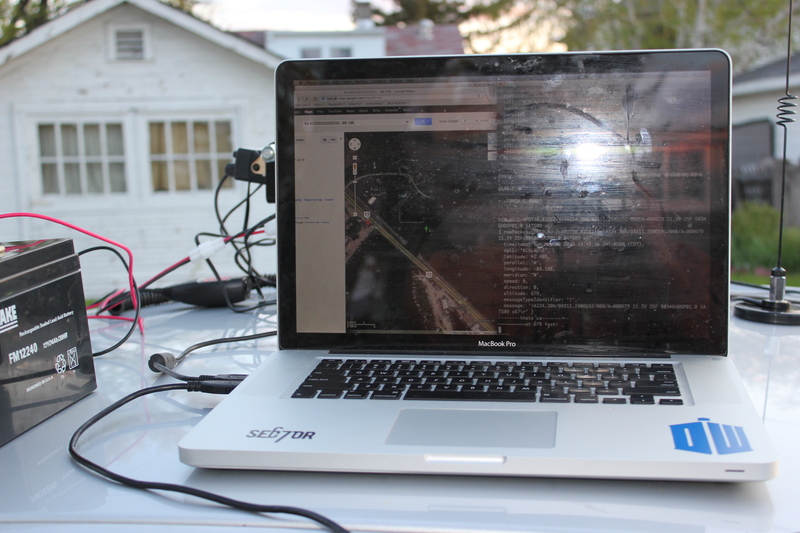 The APRS system worked, although next time we will need to do a better job with the altitude. Knowing that would have helped our tracking and recovery a lot. 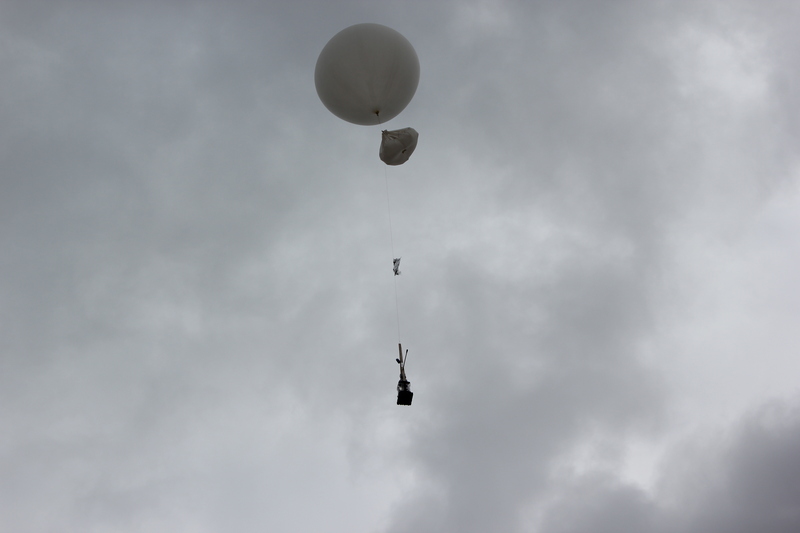 We are also developing tools for finding a balloon using a ground based receiver so that when we get close we will be able to get its signal even if other stations can’t. This should help us find it even without seeing it. We need to launch earlier in the day. 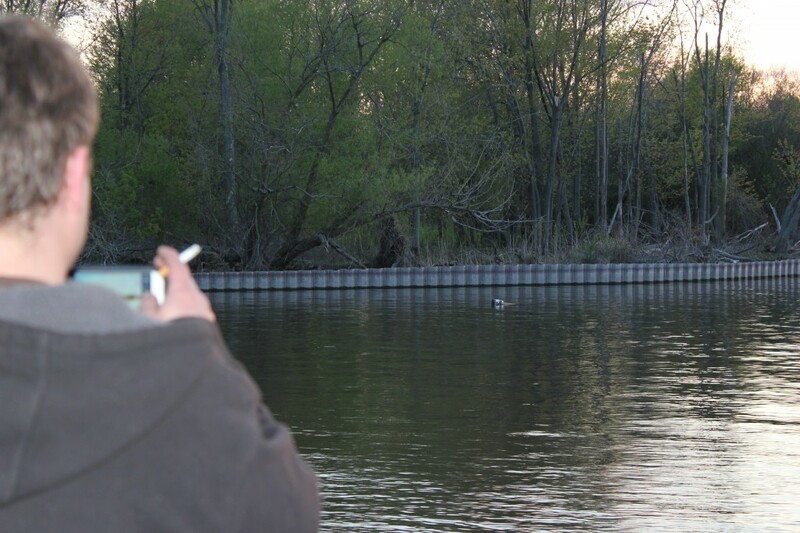 A 1:30 launch gave us no time to find the package before it got dark. 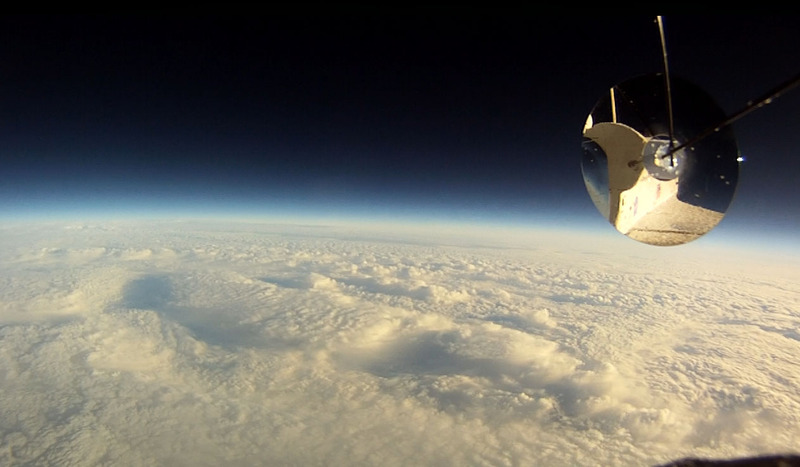 The GoPro was a great addition to the package, and gave great stills as well. It’s heavy and expensive, but definitely made for a great result. The mirror at the end of a boom was cool and gave us multiple angles with only one camera and no risk of having anything valuable at the end of the boom. 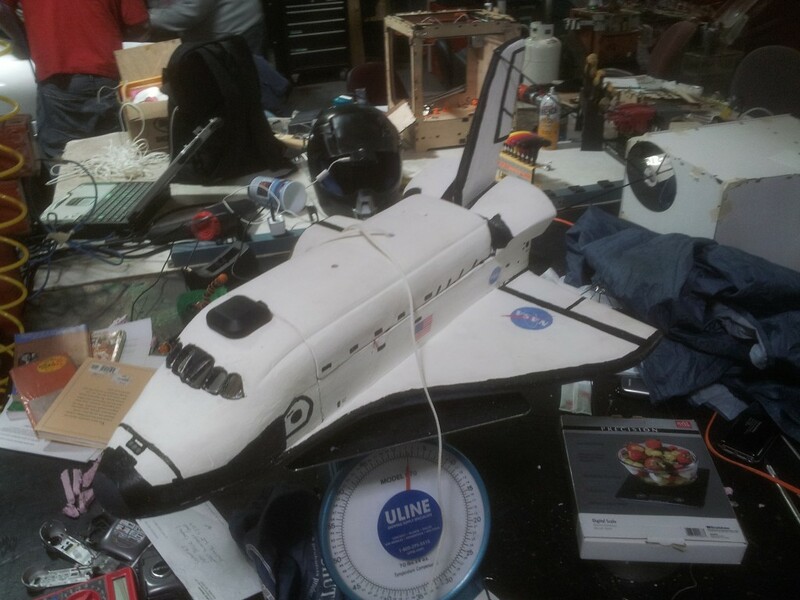 The space shuttle was remarkably stable and looked awesome. 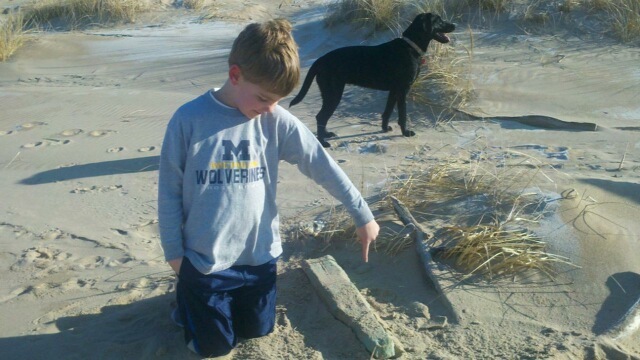 At this point, all we know is that it was found on a beach in Grand Haven, MI, which is directly across the lake from where it should have landed. Recovery is being negotiated now. This gives us a recovery time of 3 months from launch. The phone is soaked, but may still work once it dries out. Apparently the SD card has photos on it, but none from the launch. We’d like to thank our Honorary Apollo67 Michigan Recovery Team for finding and returning the payload (after they show it off at school). These are photos of the recovery team (reprinted with permission). After our lost initial trial, we decided to try again, this time with some backup devices that would aid recovery. We still wanted to make sure it was easy to handle the hydrogen, we wanted better documentation of the filling and release process, and we wanted to above all test the app. Because our goals were different and our participation in the contest was no longer an issue, we took some additional liberties. Jesse built a much more attractive enclosure to look like the Apollo re-entry modules. 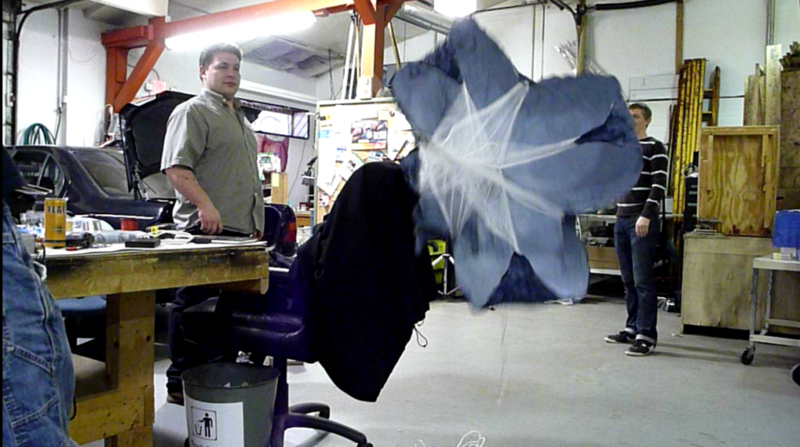 We added a parachute because the foam was more dense and the payload was heavier. But the balloon remained the same. 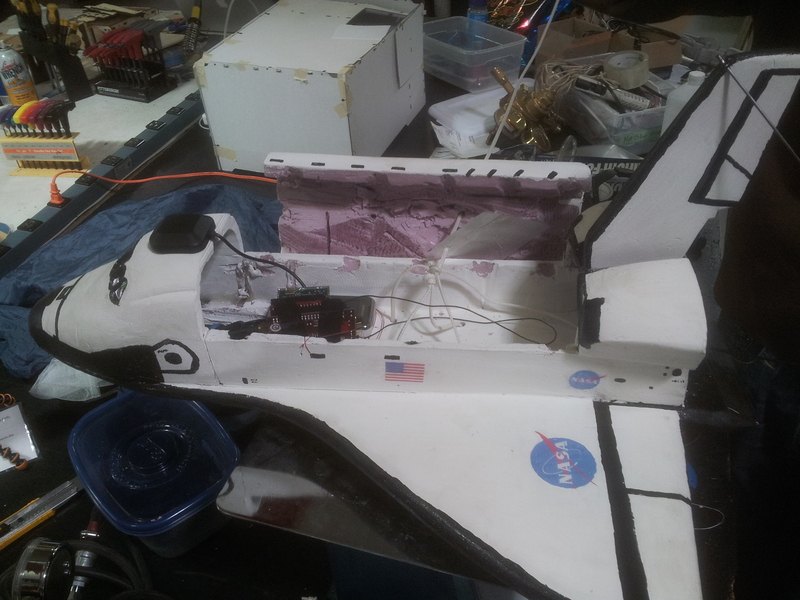 Next we worked on the payload. Because we had no indication of the state of the phone, we wanted a reliable backup phone. Jesse volunteered one of his, and we used the Sprint Family Locator service to track it. The phone itself had no special software running on it; it was just firmly attached to the enclosure. Jesse also had a phone that was set to record video the whole way. It had a window out the side of the enclosure. At the top of the enclosure was another window, this one for the android phone we were testing. Sadly, the phone caused us a lot of problems. The first phone, also Jesse’s, was an Android version that was too old for the app Issac wrote. It wouldn’t work. Chris volunteered an old G1, but it had an old version of Android as well. We tried to upgrade it to CyanogenMod, but unfortunately bricked the phone in the process, so it was useless. A call for help out to the Sector67 community yielded another potential Android phone. This one was a Verizon phone with a malfunctioning power button. We were able to fix the button (in the sense that we fixed it so we could turn it on, not in the sense that it was working properly as designed), and were back in business. However, since it was a Verizon phone without a plan, we weren’t able to set up a line so that it could text or send data. It would have to operate entirely alone. Well, in a sense. 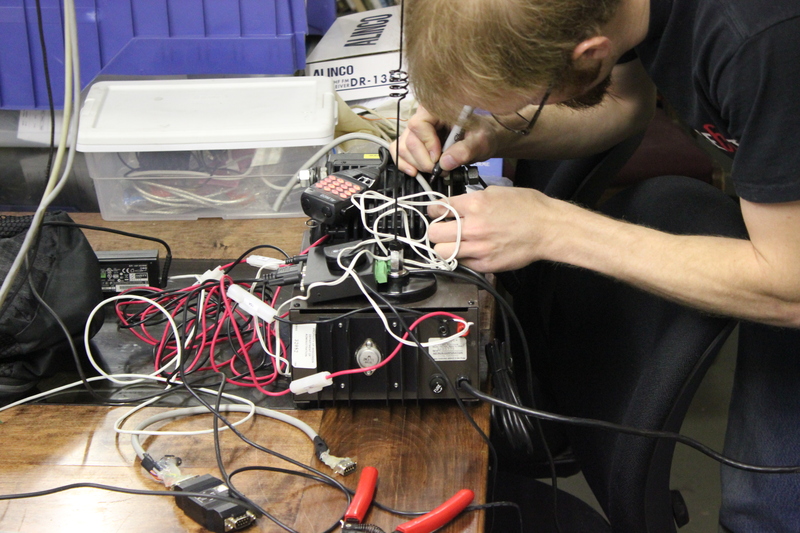 While we were spending time getting the phone to run the software, Issac and Chris were busy rigging up a radio so that it would plug into the headphones of the phone. The radio was set to relay whatever signal went through the headphones, and Issac programmed the app to use the Text To Speech of the phone to relay the coordinates of the device. With a powerful receiver on the ground, we should have been able to hear the phone speaking its location to us long after the balloon had ascended out of cell range. The phone, stripped radio, and stripped battery pack. By 2:30pm, 1/2 hour after we had decided it was too late to launch, let alone leave to go to the launch site, we were finally on our way with all the materials. Well, most of them. This time our launch location was Mt. Horeb. The wind wasn’t blowing as strong as the first launch day, so it was projected to travel much less. 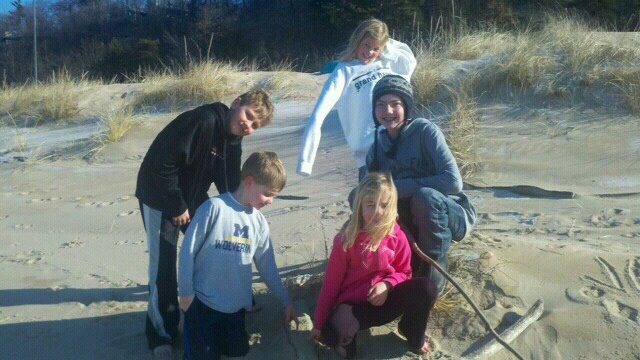 Mt Horeb was a safe distance West that still had us landing between Madison and Lake Michigan. 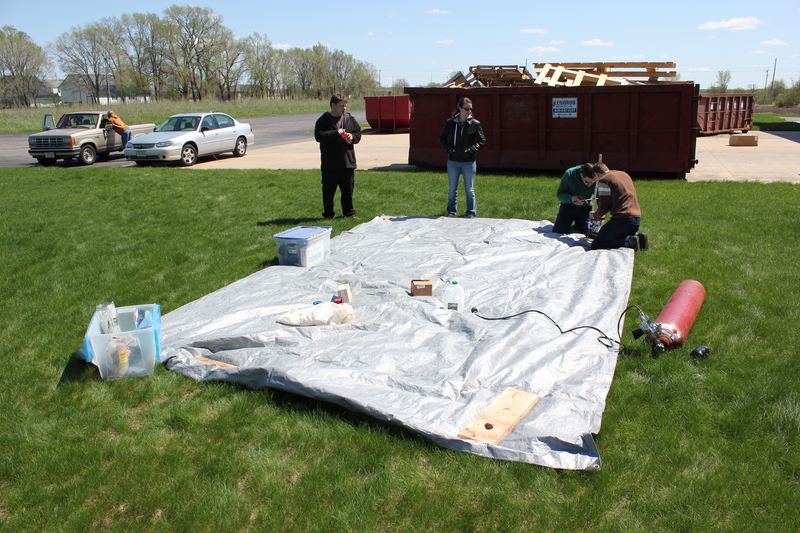 We arrived at our launch site, which was just off the highway, and prepared the tarp and parts. 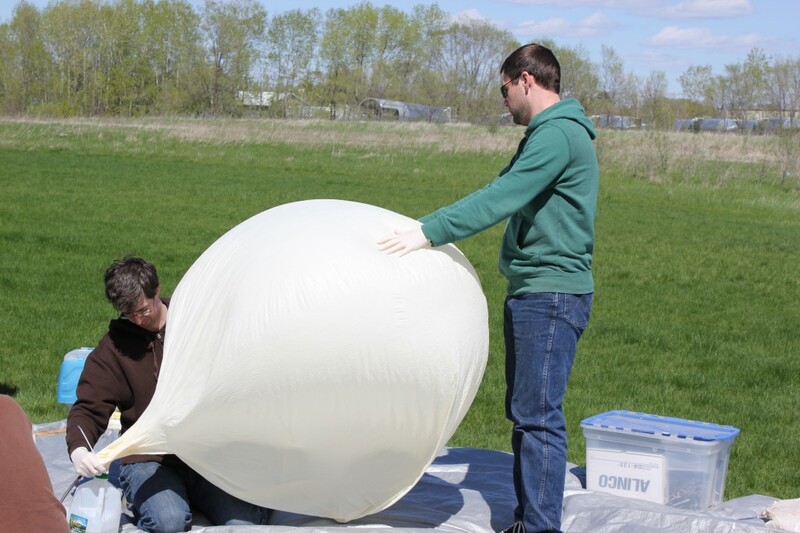 While the balloon was being inflated, Jesse and Issac were busy getting the payload prepared. This involved making sure the backup phone was on, making sure the video phone was recording, embedding the Android phone into the top of the shuttle (made more difficult by the fact that a critical piece of the styrofoam had accidentally been left behind and the phone hadn’t been inserted with the cables attached and didn’t quite fit), making sure it was running, sealing it all up. In the cold the hot glue was cooling almost instantly, making it all even more difficult. Finally, everything was ready. 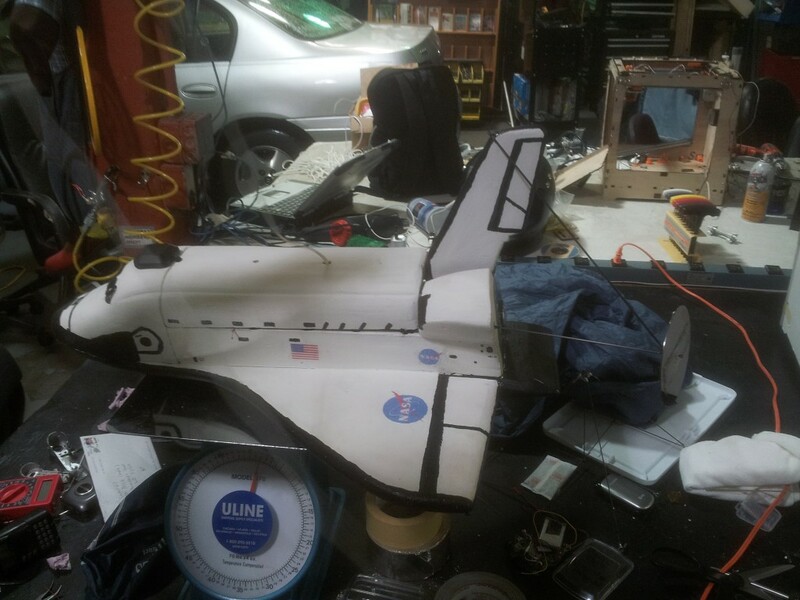 We confirmed that we could hear the payload reporting its location over the radio, that everything was connected, and we let it go. 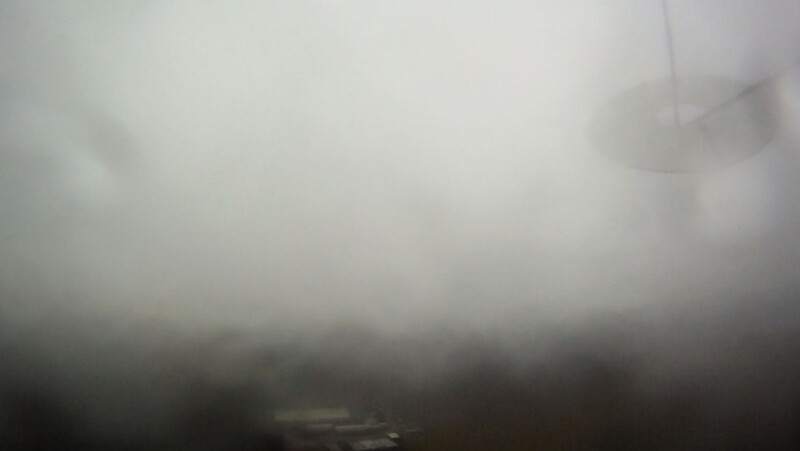 After watching it rise, we packed everything in and waited for it to report its location over the radio. It did not. Shortly after that, I discovered the battery cover for the phone still inside the car. We formed a theory. 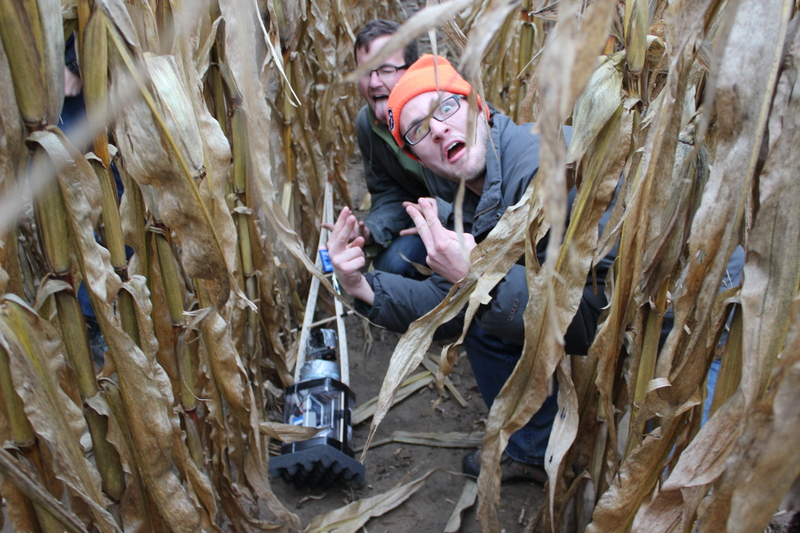 With nothing else to do, we headed back to Sector67 to remove the tank and wait to hear from the phone. Hopefully after it landed the phone would report its location via the Sprint Family Locator, assuming it landed somewhere with signal. Fortunately, a little over 2 hours after launch, well into darkness, the phone reported its location, and it was still moving. It had gotten cell signal while still in the air and was on its way down somewhere near a golf course in Jefferson, not too far away. The search team went out and recovered the device. Fortunately, it was found. Unfortunately, the theory was correct; shortly after letting go the battery to the android phone had fallen out, which is why it was no longer reporting its location via the radio. This also meant that we didn’t have any data recorded about its altitude or coordinates during the trip. No data at all. The video camera had also messed up. Somehow in the hurry of putting it all together, someone had pressed a button on the device to stop it capturing. It’s a good thing we had the backup phone. It’s amazing we were able to find it in the dark. Once again, the lesson (which we clearly did not learn after the first attempt), was to take things slowly and methodically, and only launch under the best conditions. 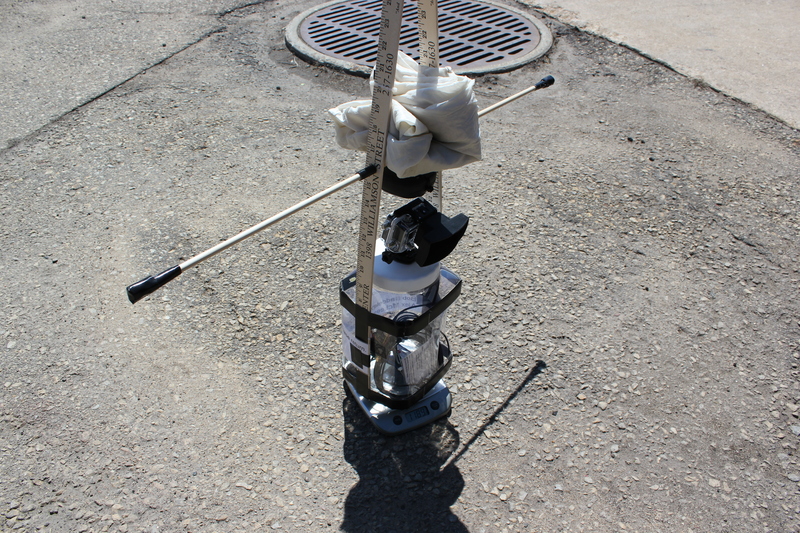 We were lucky to get this payload back, but it did us no good because we didn’t collect any information at all. Just because we didn’t get any results doesn’t mean we didn’t see room for improvement. Here’s a partial list of things we noticed and things we’d like to improve. Filling went reasonably well, but we didn’t have a way to measure how much gas had gone into the balloon, and we only had a rough estimate of the diameter when we released it. For calculations, we’d like to know some harder numbers. Perhaps some kind of scale to determine the lift of the balloon just before releasing it. Three people was not enough for the launch. We needed at least one other person dedicated to documenting the process. A game plan needs to be established before launching. Each person should know their responsibilities and the order of operations. We made a lot of changes at the last minute because we were running out of time. It would have been nice to plan everything out and have it constructed slowly and methodically. Unfortunately the lateness of the foam made this difficult. We should have waited for a better day to launch. 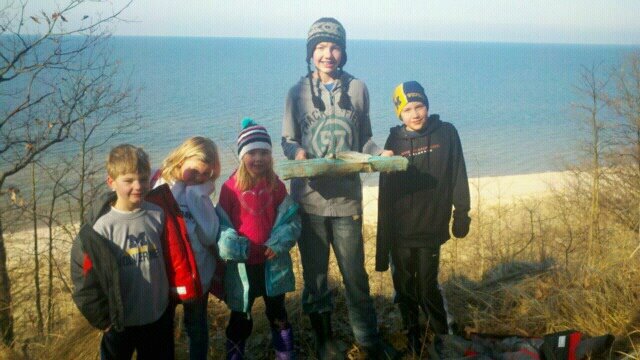 The winds were strong on our launch day, and we may have lost the package in Lake Michigan. We should investigate more reliable and continuous methods for tracking besides cell. Our launch location was great. We had separate vehicles that were already en route to the destination when we launched to speed up recovery. 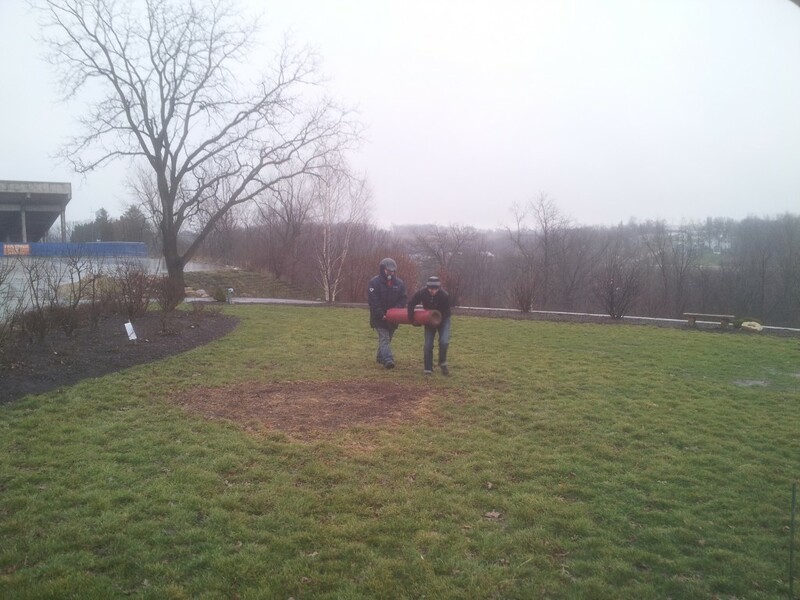 Filling the balloon with hydrogen went off successfully with no problems. We have no data about the phone. It’s been over 32 hours since launch. When we launched our estimates had it landing within cell coverage somewhere between Madison and Milwaukee. Because we heard nothing from the phone, even immediately after launching, we can only assume that it got out of cell reception range and stayed out throughout the entire trip. There are many reasons it could have failed, but without data, we can’t rule any of them out. We know the app was running just after launch because we got two data points. We know the balloon was ascending quickly. 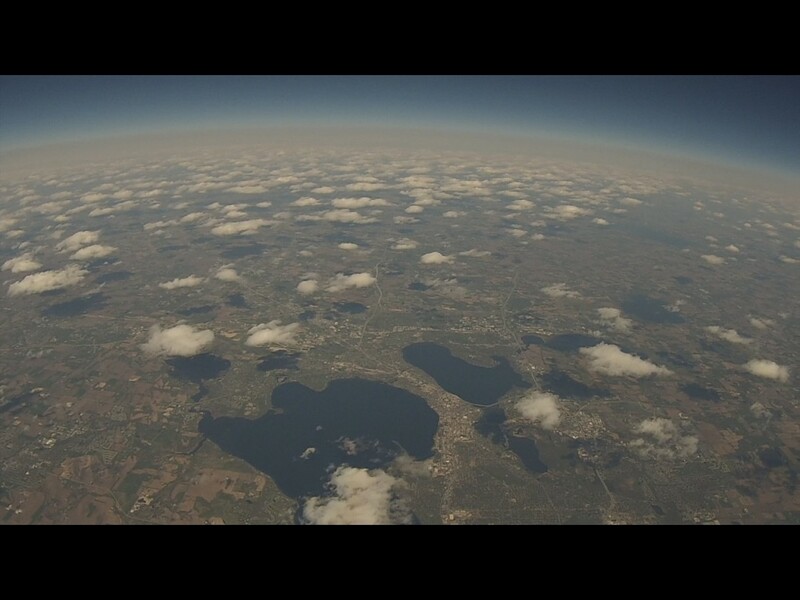 We know we filled the 300g balloon up to about 5′ in diameter with hydrogen and a ~350gram payload attached to it. Because we got no data at all, we must assume a low level failure; either no reception or the phone turned off. Failure of the app would have been detected because the other applications were still running. 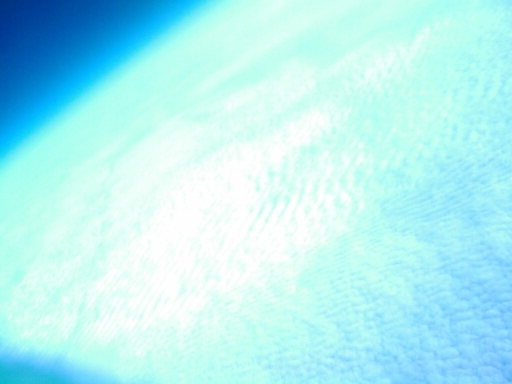 If we had filled up the balloon too little, it’s possible that it could have ascended too slowly and burst much higher after drifting for much longer. 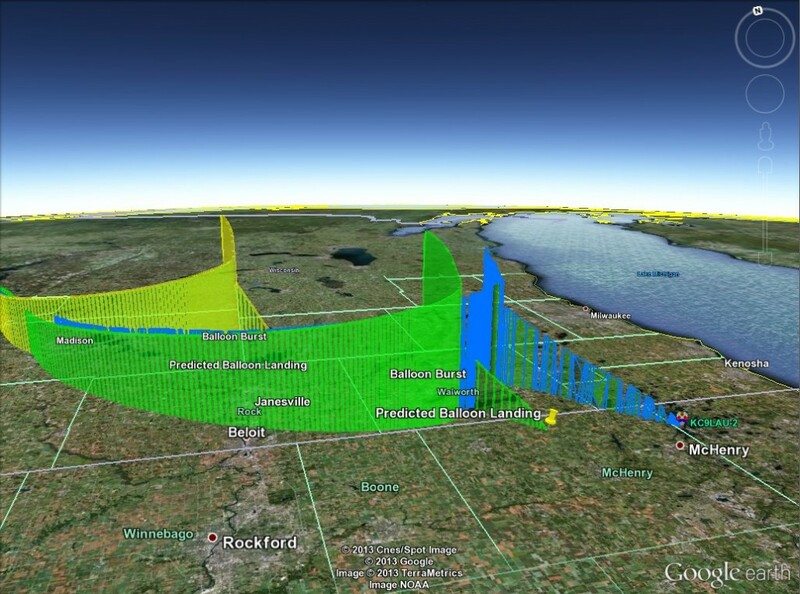 Projections using these possibilities had us landing in the middle of Lake Michigan or in Michigan itself. The only thing we could have done differently is wait for a day with better conditions, but because of the nature of the contest and the approaching winter, this was not possible. If the foam had different insulation characteristics from the foam we tested, it’s possible the phone froze or the battery died prematurely because of the cold. There is little we could have done differently to prevent this. 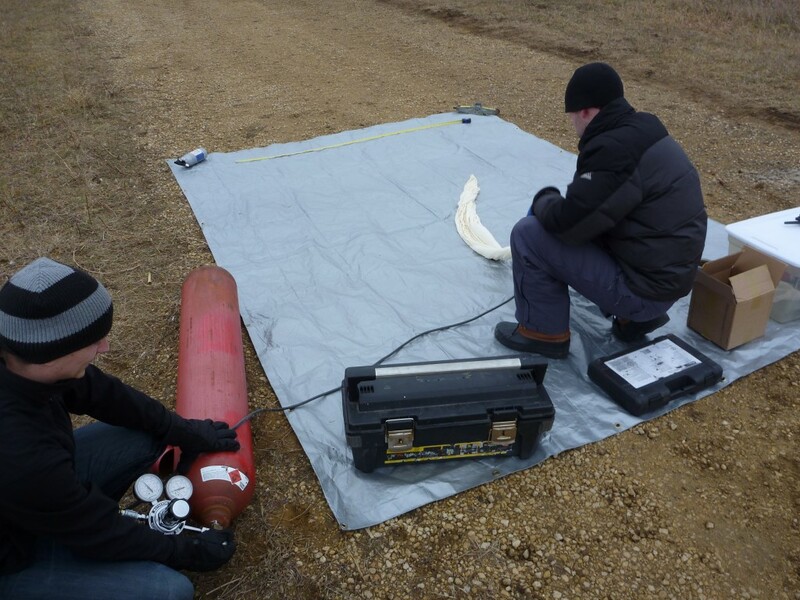 We didn’t get the foam we wanted until shortly before launch, so we weren’t able to test its characteristics in cold, and only informally tested its capabilities for impact suppression. 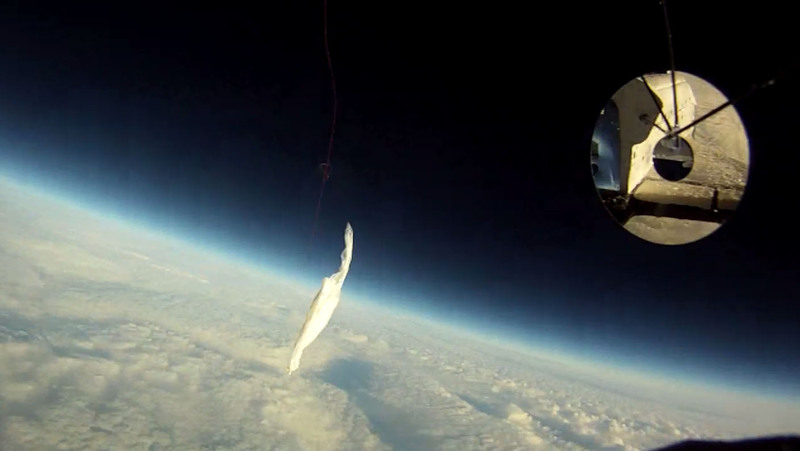 Additionally, we weren’t able to perform a drop test at any altitude above a few feet, so we could only estimate the rate at which it would drop and the force of impact. If the application had reception on the descent and before it landed, we would have gotten something. We have no evidence to suggest anything about the impact. Sadly, without information, we only have unanswered questions and no entry into the competition. We hope that the phone will be found by someone and returned to us intact so that we can understand what happened. Our next steps are still undecided. We would like to continue developing this site as a resource for other people who want to launch their own balloon. 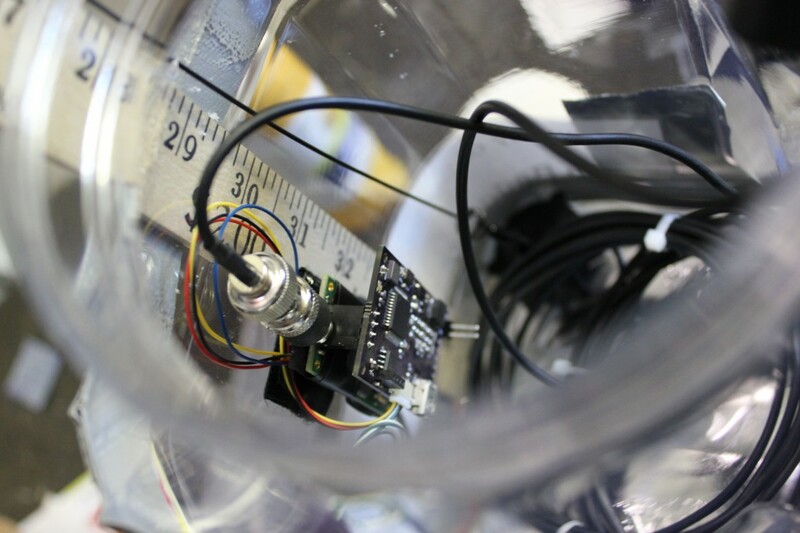 We would like to continue performing tests on the materials to verify that they will work for the purpose, and we would like to develop additional hardware to aid in the release of the balloon and perhaps trigger or collect data from other sensors. With such a cheap package and low weight, we have a lot of room to work. We may investigate redundant means of tracking, or different cell providers for our area. Just because we didn’t find our balloon doesn’t mean we failed completely. Well, it does in the sense that we can’t enter the competition and we lost our data and materials. But we also gained a lot of knowledge and hope that you will find it helpful in your efforts.